Whenever we talk about velocity or acceleration, we always have to determine a reference point and all the information we determine is relative to this point. Typically, this reference point is stationary. However, in some cases, such as when you're looking out of the window of your at the surrounding cars, who are driving at the same speed as you, they look almost stationary. This is due to a moving reference point. Simply speaking, the velocity of moving objects with respect to other moving or stationary objects is something we like to call relative velocity, and this motion is called relative motion. A reference point is very important in physics, and all our calculations are according to reference points. Whenever we calculate the velocity of a plane, or car, it's always their relative velocity to us. 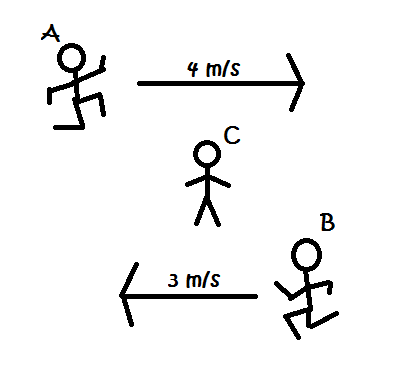 In this particular example, relative to stationary person C, Brian, person A, Sam, appears to be moving right at 4 m/s, and person B, Aaron, appears to be moving left at 3 m/s. However, when we take Sam and Aaron to be the reference points, they would think that the other person is moving past them at 7 m/s, because relative to themselves, the other is indeed moving past them at 7 m/s. When we take this concept into account and make it into 2 dimensions, x and y, vertical and horizontal, we have a whole new type of question: commonly known as riverboat questions. Notice above, how the from the reference point of the boat, it is moving North with its velocity, but the river itself is also moving East with its own velocity. 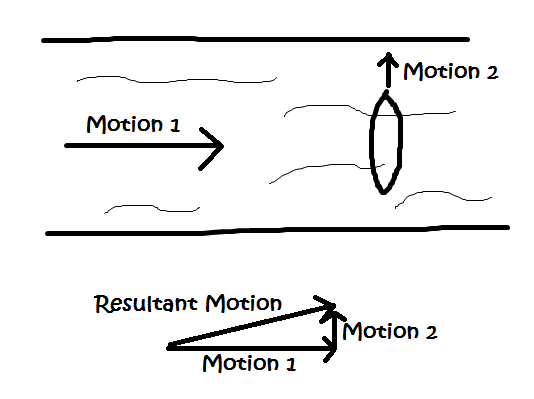 As a result, from a more objective standpoint, the boat's motion isn't simply its own motion, but combined with the motion caused by the flowing river.